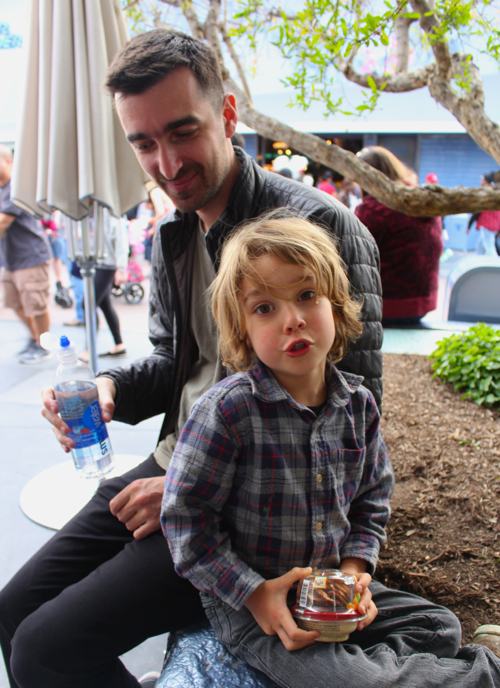 A Few Pics From Our Annual Family Disney Adventure, Because Holy Moly, The Kid Is Turning FIVE. 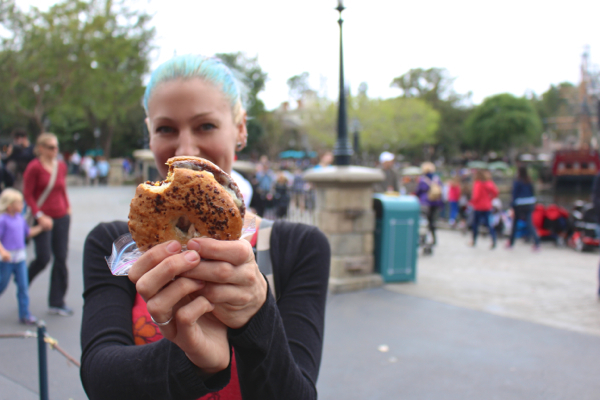 And Also, More Tips For Eating Vegan At Disneyland! 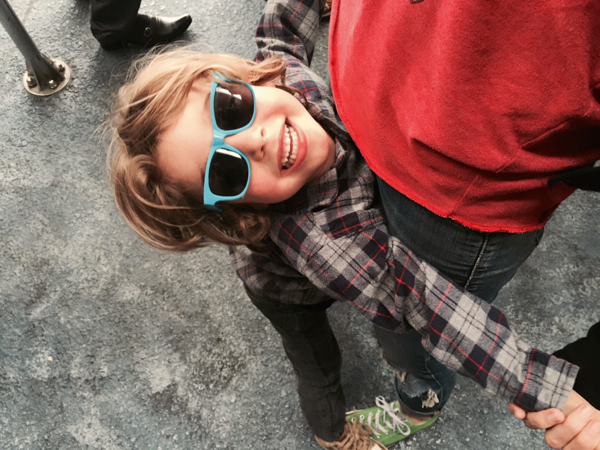 Not even 5 and already acting too cool for school. Haha, I love this picture. Dudes. My kid is turning FIVE. What in the what? How did this happen??! 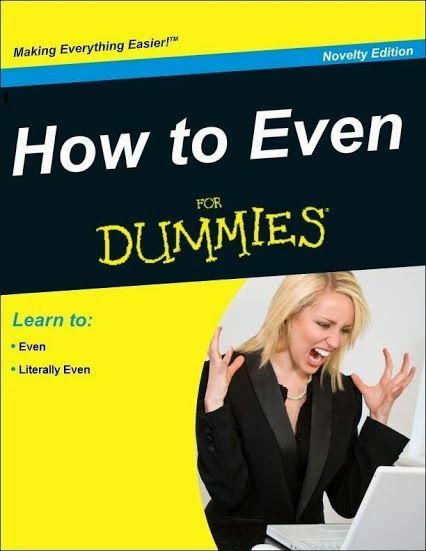 No but seriously, I’m for-reals actually completely beside myself over this. It just doesn’t compute. I like, literally can’t even. But okay, let’s just go with it. 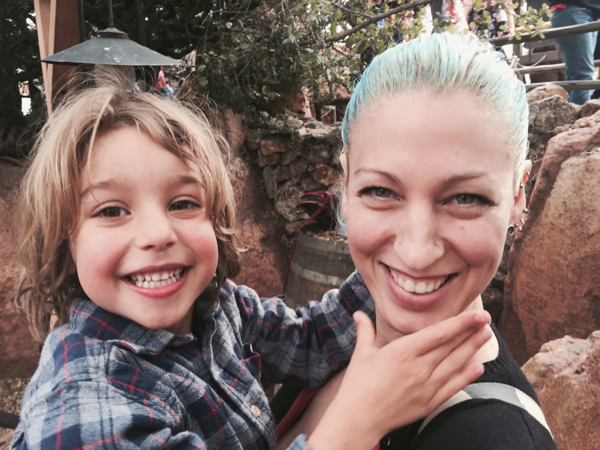 So my kid is turning FIVE, and like we have promised to do every year from now until he reaches the “OMG you guys are embarrassing me!” stage, we made our annual family pilgrimage to worship at the alter of the Mouse. I wrote a little bit last year about the complicated relationship that I have with Disney (so much nostalgia! so much that’s socio-politically problematic! so much joy! so much childlike wonder! so much consumerism and anti-eco-friendliness and un-sustainability and and and . . . okay, you get the point – so complicated! ), but suffice it to say that this yearly trip is something that we love to do together, as a family. And it means so much to all of us. 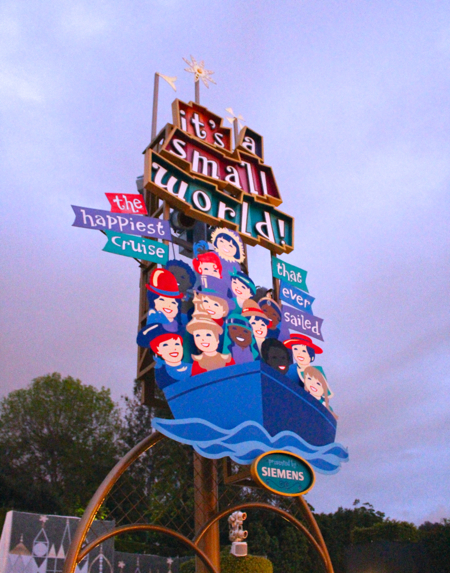 First things first: a direct delivery into Tomorrowland, via the monorail. I’d never ridden it before! And very cool to bypass the front gate, since we’d pre-bought our tickets online. We chowed down on our brown-bagged lunch in line for Pirates Of The Caribbean. Tofu-patty cheezeburgers on gluten free onion bagels. YUM. And just what we needed to fuel our fun! I do think the key to having a successful “Vegan at Disneyland” experience is really just a little bit of forethought. A few essential food items (dense, protein-rich choices that pack up light and travel well) combined with a general sense of what’s available and where to get it (I did my research the night before, and carried with me a little list of every vegan option/entree broken down by “land”). 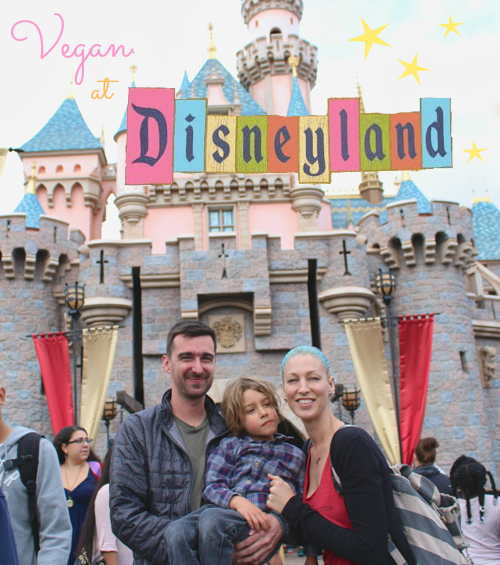 Disneyland is actually surprisingly vegan-friendly, and I’m certain you could easily get by without bringing any food of your own, if you wanted to. I feel like every year I bring less and less . . . but it’s still nice to have those backup snacks on hand. Waits is a huge fan of the Mamma Chia squeeze pouches, and I love that they have more protein and calcium than simple fruit squeeze pouches. Thunder Mountain Railroad! 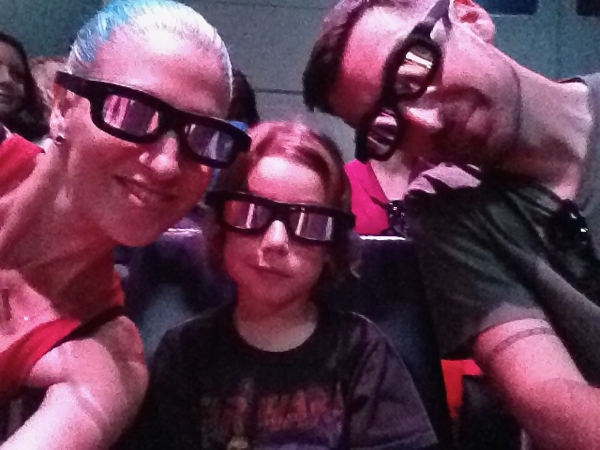 Waits’s first real roller coaster, and Damian and I agreed it was our favorite ride of the day. We were both laughing hysterically like a couple of goobers the entire time! 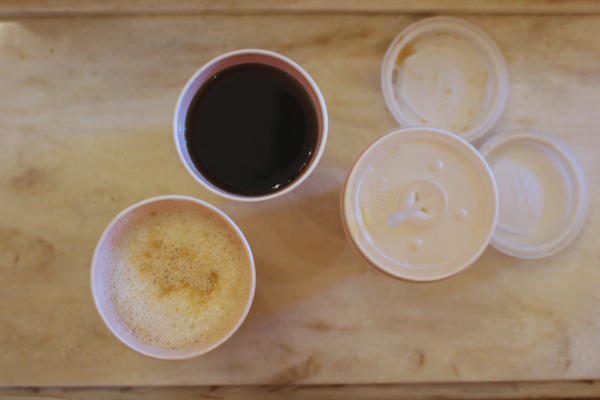 Soy latte (me), black decaf (Damian), and cold soy milk (Waits). Just FYI, the Jolly Holiday Bakery Cafe in Main Street USA is the *only* place in the entire park that you can find soy milk for coffee/espresso. Waits and Damian split a soft pretzel. 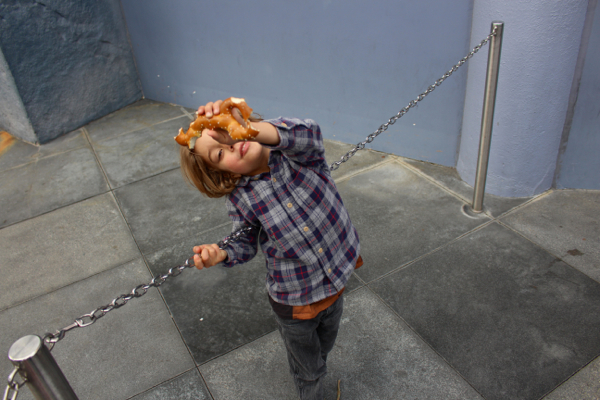 All of the “Mickey Pretzels” sold throughout the park are vegan! Goofballin’ in line for Space Mountain. 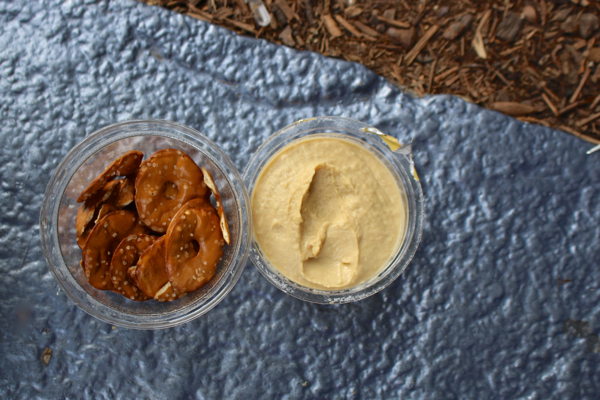 Quickie hummus + pretzel pack. They have vendors selling hummus, Craisins, fresh pineapple spears, giant pickles (I get one every time, oh yes I do), fruit cups, and chips – all vegan! – all over the park. Old school. It’s been revamped, and was much less racist/problematic than I worried it would be. Phew, thank you Disney! 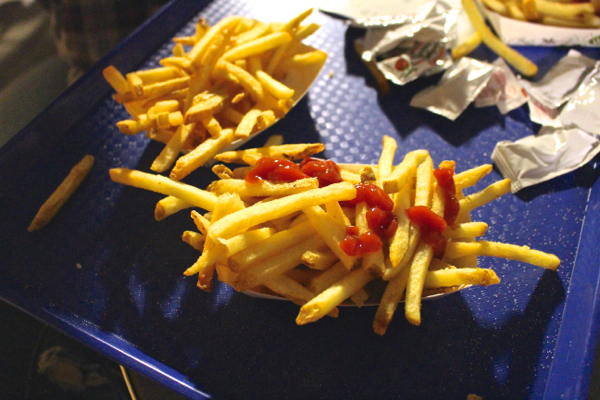 After nightfall, french fries for three at the Tomorrowland Terrace. Because when in Rome . . . 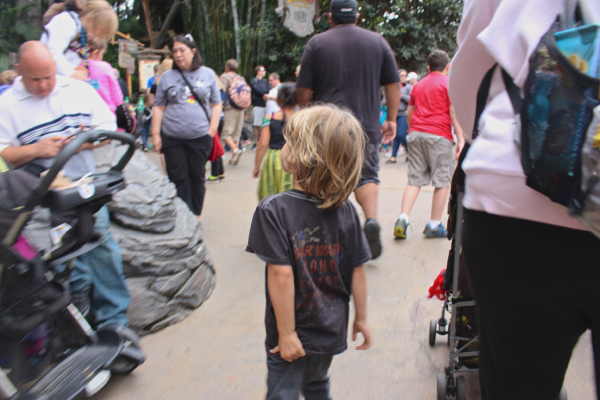 It was such an amazing day, filled with laughs and love and fun – so much fun that we’re already eager for next year’s trip, when Waits will be tall enough to ride Indiana Jones! Wahoo! But in all seriousness, this tradition means so much to me. It symbolizes everything that matters and everything that we’ve worked for. 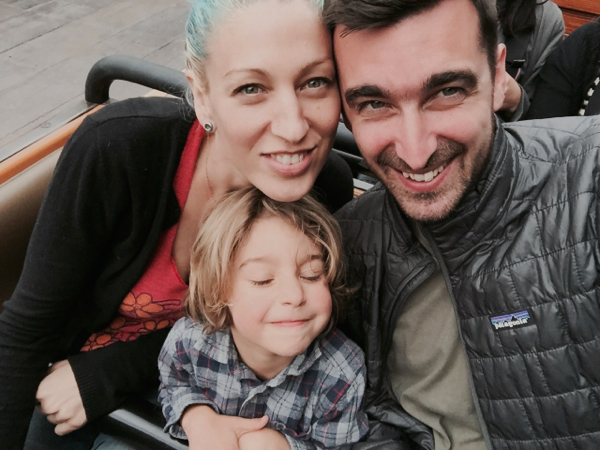 And I am grateful for that – for this strange, sweet, safe little space that Damian and I have created where we can raise our son. So grateful for our family. 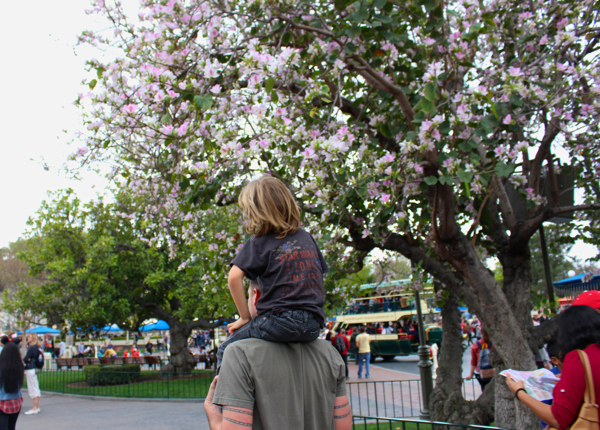 So until next time – we love you Disneyland! Beautiful photos! 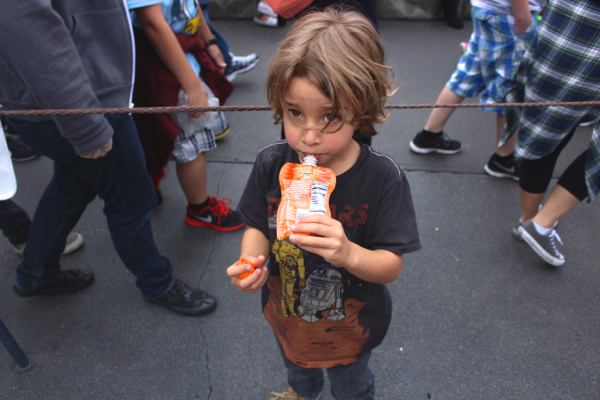 I totally get the mixed feelings about Disneyland, but seriously, it’s so great that someone is checking out the vegan options for all of us!! Also, major, MAJOR, kudos on continuing to do this as a family. That’s really special, and it gives me all the feelings. A very happy birthday to Waits! You have a beautiful family and outlook! Beautiful pic of you guys on Thunder Mountain Railroad.. You all look so happy and Waits looks adorable. Happy Birthday Waits!!! This is probably the dumbest question in the world, so I’d like to preface it by saying the kids I baby sat this summer were a) dairy free vegetarian b) picky eaters and c) about Waits’ age. I struggled trying to explain why they couldn’t have certain treats when we were out exploring even though they looked like things their parents would give them. IE: coconut ice cream vs. dairy ice cream. The options for treats I offered when out and about (that were up to the family’s standards and request of me) were never “good enough” when they saw other kids having what they wanted. Best summer ever because they were great kids, but a little bit of a struggle sometimes. So here’s the question: in a place like Disney (or anywhere), where there’s so much at kid level that may look familiar, but have ingredients that aren’t veg*n how do you explain “yes, or no”? I didn’t have the language to communicate this concept over the summer, and I’m sure that you’re in more of a regular dialogue with Waits than I could have been with my kids about ingredients. But I’d appreciate any insight from you, or anyone about their experience! 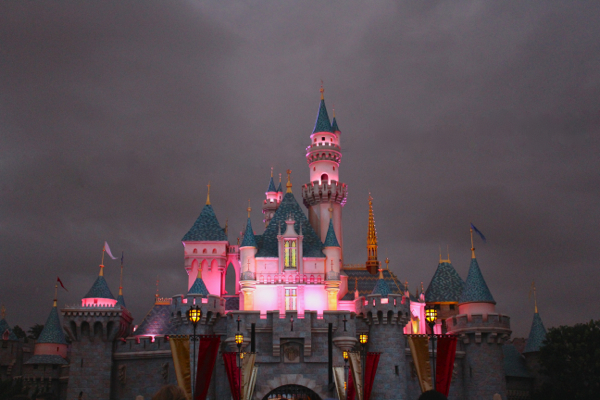 I was just at Disneyland last week with my family! The veggie gumbo in a bread bowl was SUPER yummy in New Orleans square. Also, the dole pineapple whip from the tiki room is vegan. I didn’t wind up bringing any snacks with me and I ate really well as a vegan at disneyland! I meant to make a helpful comment on your last post about Disneyland, which I used this New Year’s eve and day when I took my family to the Park for the first time. I know your advice is about the park itself, but I wanted to make a plug for two vegan restaurants I found within walking distance outside the park, which would make great dinner options for after leaving the park. One is called Vegan Pizza and it features–you guessed it!–vegan pizza. AWESOME, and they deliver for free to anywhere in the Disneyland area. And even closer was an all-vegan Vietnamese restaurant called Thuyen Vien. IT WAS AMAZING. These two places were lifesavers when we were there from out of town, and we can’t wait to go back –both to the park and to those restaurants! priority. Kudos to you! Disneyland? Not my favorite place, but I took my kid there a few times and then had her tag along with other friends. It doesn’t really matter what it is, as long as it becomes tradition. That’s the fondest memories one can have from childhood – family traditions !! Love it! Happy Birthday Waits!!! Hi Lauren, man that’s interesting. I’ve seen Yelp reviews that make similar claims but I’ve verified it with them SO many times that I figured it was just a misunderstanding/miscommunication/language barrier. Who did you speak to? I’d be crushed if it were true, but of course I want to know the truth. I’ve just gotten so many contradicting stories! Bah . . . I wonder, how old are these kiddos? And do their parents talk to them about their dietary restrictions? I guess I’m just sort of surprised because I’ve known a lot of vegan kids and a lot of “allergy” kids, and they’re all pretty aware of their restrictions from a pretty early age. I don’t mean that to sound judgmental, but just wondering if maybe the kids have not had enough conversation around the way their family eats? I think that’s really important, to verbalize and normalize the fact that different people eat different things. If you/the parents can acknowledge it rationally, without stigma, then it just becomes a part of their internal narrative. Waits knows to that he only eats vegan things, and his little 2 year old friend knows that he can’t eat gluten, etc. It sounds like maybe the parents of these kiddos are not being communicative enough. If they’re giving them coconut ice cream but just calling it “ice cream” and never telling the kiddos that most people eat dairy but they don’t eat dairy so they eat non-dairy treats instead, because dairy is not good for their bodies, etc, then the kiddos are just not equipped to navigate those situations outside the home. It’s all just about being open and talking. And making the idea that different things are available to different people (*available* is a really good word to use) just a normal idea that they deal with. As far as a situation where you’re dealing in the moment, without a background of parental conversation, that’s tougher. I think things like “not available to us” and “those foods hurt your body” and that kind of stuff can be helpful. I am hearing so much good stuff about that gumbo! And Dole Whip was at the TOP of my list when we went, but man it was toooo cold and I had to pass. Jeremy was so disappointed in me, haha. Next year I’ll get Dole Whip for sure! Wow this is amazing news, thank you Sarah! Next year we will hit one of these for SURE. Thanks for the heads up! Sayward you have a beautiful family. And Yeah! Thumbs up for living the life at your way! I can see kindness, friendship and lots of love! Also, I’d recommend Zen Yai downtown if you haven’t already tried it! They can make all of their curries vegan if you make sure to say “no milk/dairy and no fish sauce” (sometimes vegan gets mixed up with vegetarian). Their yellow curry is really good! OMG, I didn’t know about Vegan Pizza. But I can definitely second Thuyen Vien. They are SO GOOD! And its a family run place that has been there forever. We ate there the night before the Disneyland Star Wars half-marathon. YUM! 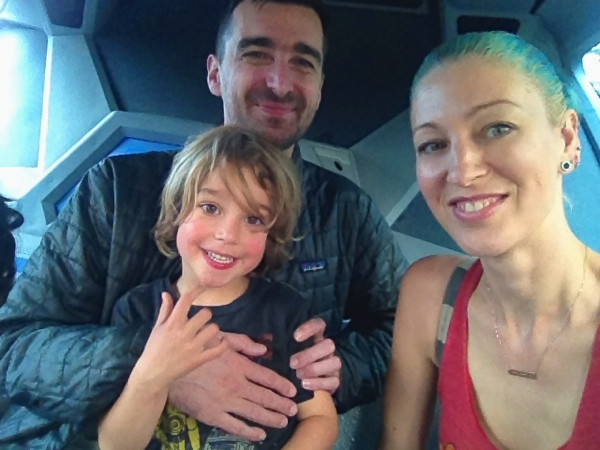 Even though we live in Seattle now, we are from So Cal and we tried to make as much use as possible of my airline points and our son flying for free before he turned two (yesterday) so my wife had an annual pass so they could go while I was on business trips. 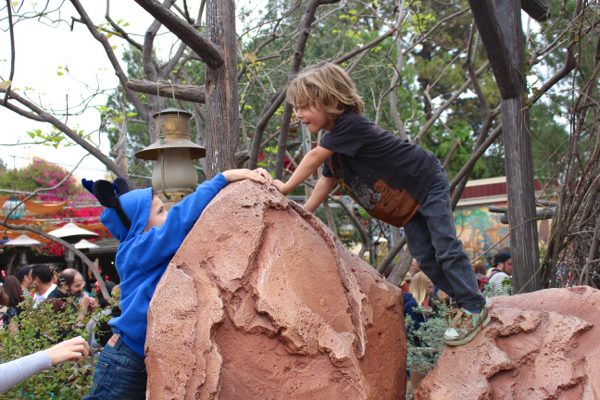 They are way more pro at Disneyland than I am, but I’m learning. She doesn’t even need a map and can tell you where any ride, restaurant, or bathroom is. Of course, now that our son doesn’t fly for free, our So Cal trips are going to be fewer and farther between so we didn’t renew our pass and Disney trips will become a much more special thing to do much like it is for you guys! Thank you!! Available is a great word. The kids would all band together when it came to allergies (there was a nut allergy in the mix too) but I think that the term “ice cream” was applied very generally in the home. There was “Special Ice Cream” and almond butter was more often than not called “peanut butter”. Although these weren’t terms I was fully comfortable with, it wasn’t always easy explaining “Its almost like peanut butter!” To a 2 year old who didn’t know anything different, and when the peanut allergy home was generally lax in their personal rule enforcement, but asked me to stick to it as best I could. Lax, as in they called almond butter “peanut-but-not-peanut-sortof?” It didn’t help that I’m a big rule lover, and enforcer. Tears were shed, but over the course of 4 months I think we did pretty good together. Thankfully, the summer ended with our favourite treat being toast and jam from the local cafe! All’s well that ended well, but I was left a little confused as how to discuss similar ideas with kids in the future. Thanks! We love Galanga (they can also make al their curries/dishes vegan – their panang curry is amaaazing!) but I’ve been meaning to try Zen Yai again. Do you ever go to . . . man what’s it called? . . . Spice Avenue? Spice Station? Something like that. Indian place up State a bit, like across from Palazzio? We just recently tried it out and they make a ton of amazing vegan dishes and the owner is super awesome. I’ll chime in to reinforce what Sayward says: it’s not your responsibility to formulate these conversations with the kids, but you might ask the parents next time what kind of language they use at home so that you can mimic it. My 5 year old has been able to verbalize for a long time what she does and doesn’t eat and why, so I know that in a similar situation she’d be able to explain it herself. That’s also how I know that it’s her choice, by the way–she is the one who wants to be president so she can make people stop eating meat (I’ll tell her later that presidents can’t really do that). But the point is–I feel bad that you were left trying to formulate the language for a conversation that the parents should have been having. But next time maybe just ask the parents what they say and how best to remind the kids. That’s cool to hear that they’re family run too. They were SUPER nice — let us into the restaurant a few minutes before they opened because it was cold outside — and the food was excellent. Yay local vegan places! Thanks! I have heard about Spice Avenue but actually haven’t checked it out. Do you ever go to Sojourner? I’m such a huge fan of theirs. They are queer-owned and super supportive of progressive causes within the community, and are currently facing financial instability. I think I love them more for their amazing ethics and role within the community than their food, but there is no denying their tempeh rueben and vegan desserts :D Also, let me know if you find out any more about Saigon! I’m such a huge fan of your blog and your willingness to be a progressive and intersectional voice between veganism and social rights.